When I asked the kids what they would like me to make over the weekend Eric requested a Chick Fil A sandwich. We do not live in an area where there are Chick Fil A restaurants. Honestly, I know I personally would not even go to a Chick Fil A. However, I see no reason not to make a sandwich in my home that everyone could enjoy. I found this recipe here. There is also another version of this recipe here. The second recipe seemed a little too time consuming to me but you may want to try it. I think the pickle juice marinade was a great way to brine the chicken. I may marinade a little longer next time. 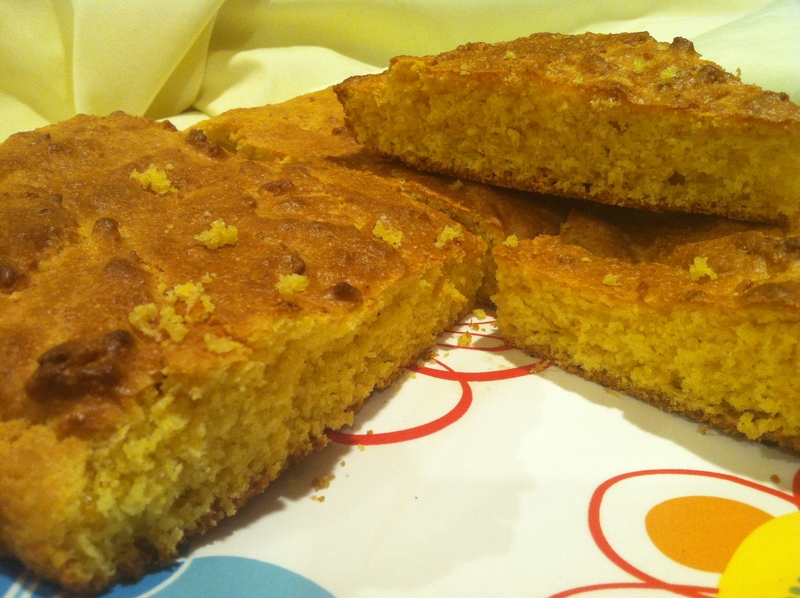 The recipe I chose, for our family, was very Simple and Delicious. 1. Wrap the chicken loosely between plastic wrap and pound gently with the flat side of a meat tenderizer until about ½ inch thick all around. 3. Marinate in the pickle juice for 30 minutes to one hour. 4. Beat the egg with milk in the bowl. 5. Combine the flour, sugar, and spices in another bowl. 6. Dip the chicken pieces each into the egg on both sides, then coat in flour on both sides. 7. Heat oil in dutch oven, should be up to 1/2 inch. 8. Fry 2 minutes on one side. Then flip over and cover with lid and fry for 2 minutes. I used a LeCreuset pan. If you have a heavy pan with a heavy lid that should work. Chick Fil A uses a pressure cooker for their sandwiches. I found that this was the closest I could get to a pressure cooker. 9. Transfer to a paper towel lined plate. 10. 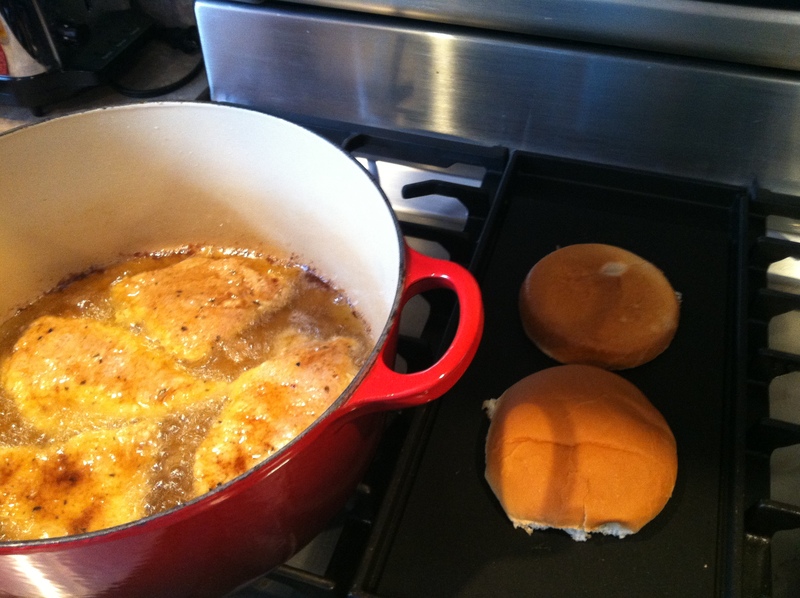 Butter the hamburger roll and toast on grill or frying pan. 11. 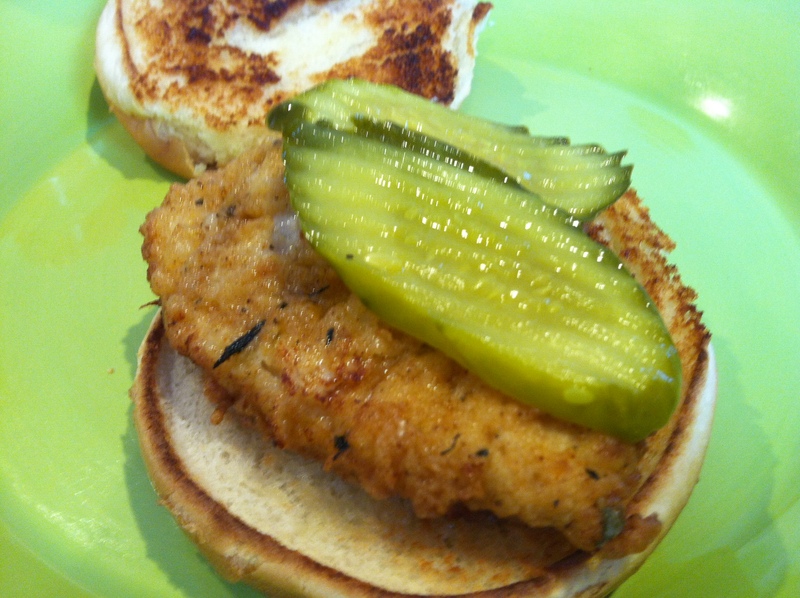 Place chicken on roll with 2 slices of dill pickles. I always ask everyone what they would like for Pizza Friday. Lately we have been adding a dessert to the mix. Rachel requested a fruit dessert. I was very simplistic with that and bought some strawberries, oranges, bananas and kiwi. I cut them all up and put them out with some Cool Whip. That went over quite well. 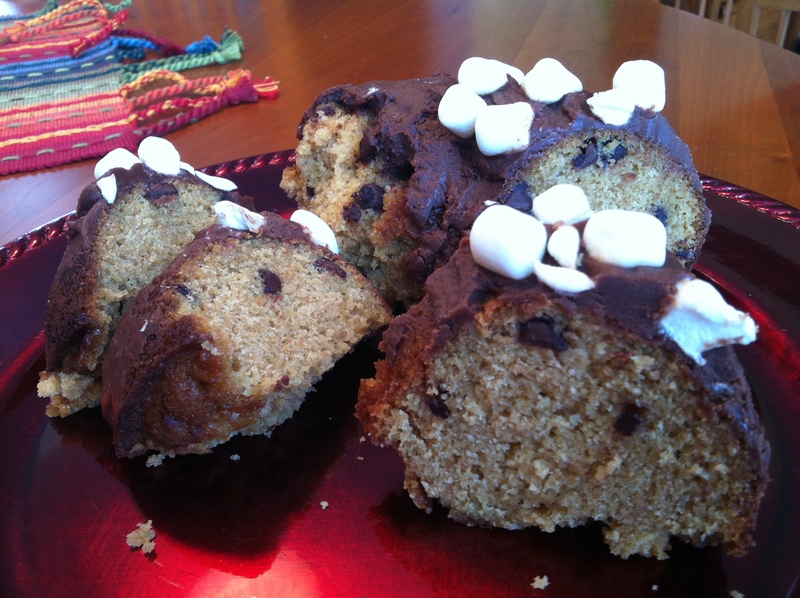 Martin had requested a chocolate bundt cake but he wanted graham crackers with white chocolate chips. I thought about it throughout the day and remembered when he was younger he liked me to get Smore’s bars. I found this recipe on another blog and went with it. Rachel and I thought it could have used more chocolate chips. The guys did not agree with us at all. Believe it or not it was very Simple and of course Delicious. 2. Place the graham cracker crumbs, flour and baking powder in medium bowl and mix together. Set aside. 3. Cream the butter for a minute and then add the sugar in small increments until mixed together. (I used my stand up mixer) Whisk the eggs together briefly and pour slowly down the side of the bowl while it is running. Add the vanilla. Stop and scrape the bowl as needed. 4. Set the speed on medium and add the dry ingredients and the milk alternately. Start with the dry ingredients, then the milk. Scrape bowl as needed. Fold in by hand the chocolate chips and 1 cup of miniature marshmallows. 6. For the chocolate glaze; Add all ingredients into a small pan. Melt over a hot – NOT boiling pot of water. Remove from heat and stir until smooth. You can do this in advance and then melt again before pouring. I did it just before I wanted to drizzle over the cake. 7. When the chocolate glaze is melted and still warm, drizzle over the cake. 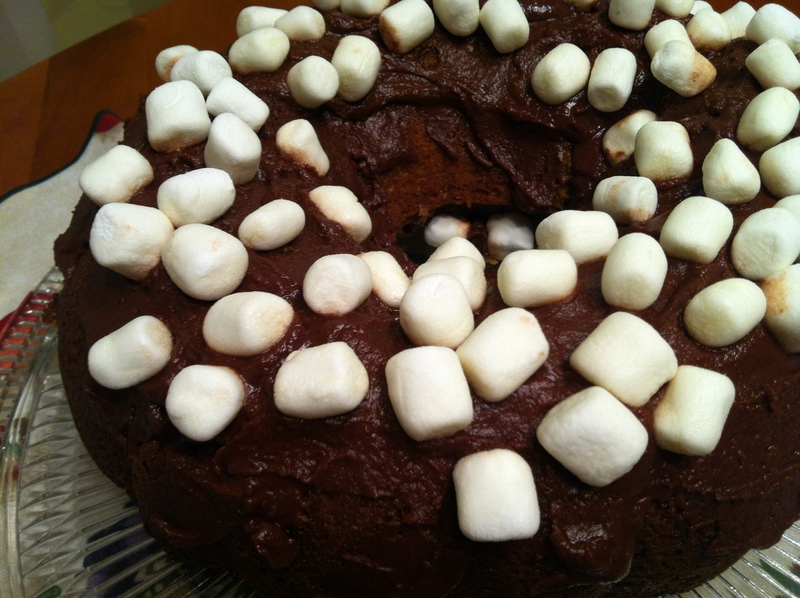 Take the 1 cup of marshmallows and place on the cake. Allow to cool completely before serving. I found this recipe in the January/February issue of Food Network Magazine. The only magazine I actually have delivered to my doorstep and read front to back. I really enjoy reading the articles and checking out the many recipes. I did bake it the way the recipe reads but I also tried something else. I baked one batch. The other batch I fried just to get brown, then I baked it. It ended up, as a family we liked the fried/baked much better. They were both tasty. 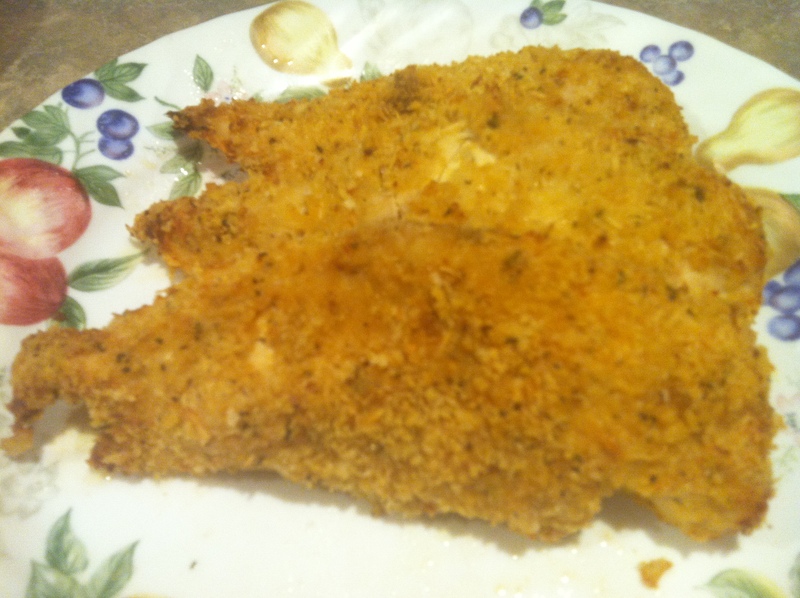 However, the fried/baked had a crunch and we enjoyed it better. Give it a try and let me know which way you like it better. This was a very quick recipe. Perfect for a weeknight dinner with a nice salad or rice and veggie. I strive for simplicity during the week and this was definitely “Simple and Delicious”! 3. In a medium shallow bowl, combine the parmesan and panko. 4. As I mentioned I brushed the mustard mixture on both sides of chicken breast. Then I placed a piece of chicken in the parmesan/panko bowl and pressed down on one side, flipped over and pressed down on the other side. 5. Put the chicken on a rack set over a baking sheet. Spray with a quick burst of cooking spray and put the sheet in the middle of the oven. Bake until the chicken is golden and cooked through, 15-20 minutes. (As I mentioned I fried to brown than baked for 15 minutes.) Let rest 5 minutes before cutting or serving. Hope you enjoy! Also makes great sandwiches for work the next day!! 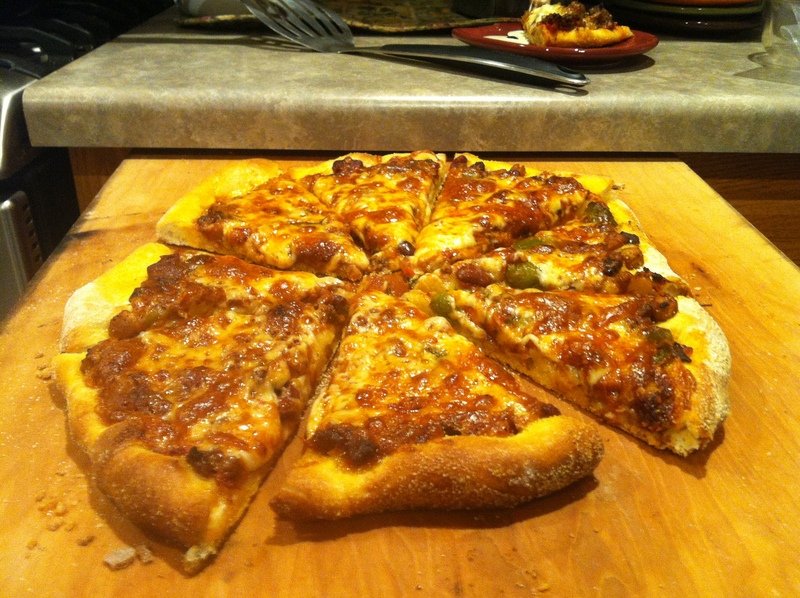 This Friday we had chicken wings, Perfect Chocolate Chip Cookies and our usual pizzas; plain cheese and a sausage pizza. I thought it was going to be a pretty quiet evening so I didn’t put too much effort into making a different pizza. Sometimes it is nice to just make the “usual ones”. Martin ended up bring a couple of friends that I did not expect. The wings and pizza rapidly disappeared. Nothing left for Kent and myself!! I opened up the fridge and saw a bowl of chili. I mentioned that to Kent and we agreed to try it on a pizza. We topped with monterey jack cheese. It was pretty tasty!! For the chicken wings I use 1/4 cup melted butter, 1/4 cup Sweet Baby Rays Chicken Wing Sauce, squirt of Sriacha sauce. Mix it together. Preheat the oven to 425 degrees. I place the wings on a foil lined pan sprayed with Pam. I then brush the the wings with the above sauce. Bake for 20 minutes, flip over the wings and brush with the sauce. Bake for 20 minutes. That is it and everyone loves them. Simple and Delicious!! 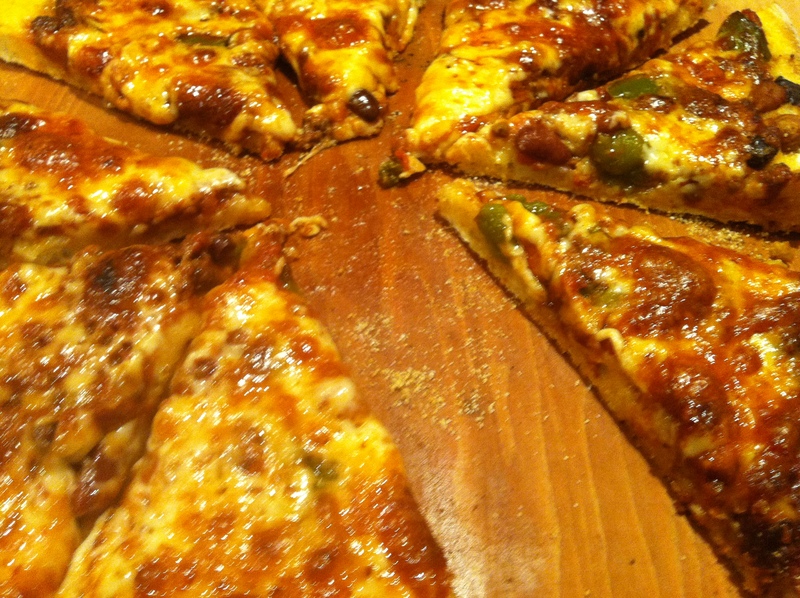 Here is the Chili Pizza. I will work on being a little more creative next week!! Ciao, Ciao!! I have made Chocolate Chip Cookies for a very long time. The typical recipe is Toll House. 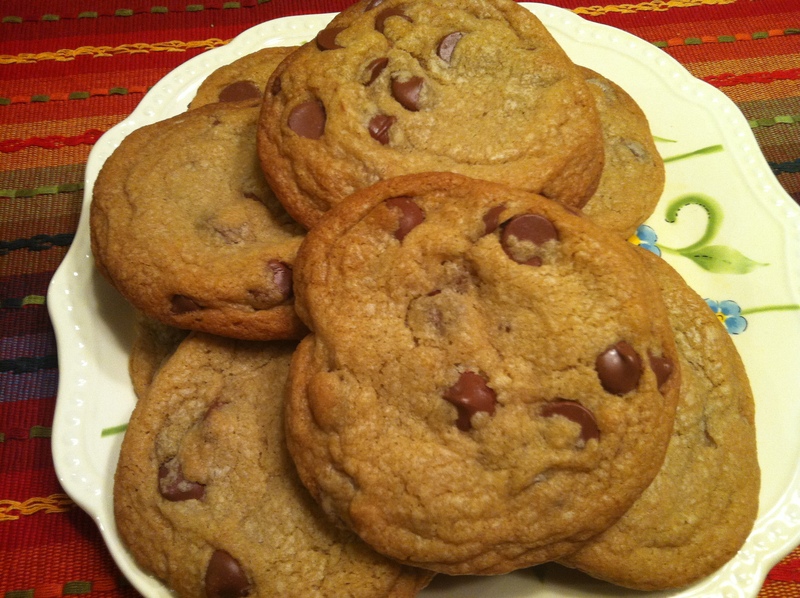 I use Ghiaradelli Chocolate Chips and always add an extra teaspoon of vanilla. That is the only change I make to the Toll House recipe. This recipe I did tonight was from Cooks Illustrated. When I first saw the recipe I thought how could anything be better than Toll House. 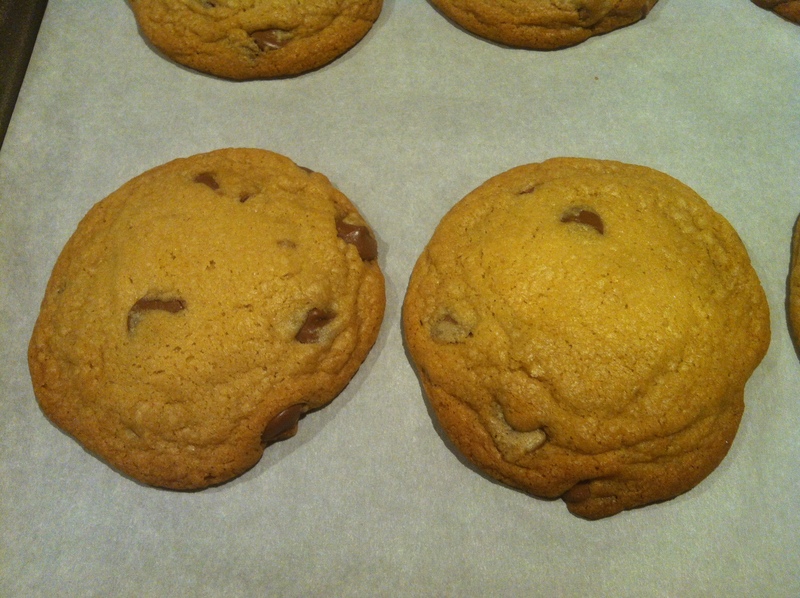 Well, let me tell ya this is one PERFECT Chocolate Chip Cookie. Oh, believe it or not, it is very Simple and even more Delicious! 1. Adjust oven rack to middle position and preheat oven to 375 degrees. Line 2 large baking sheets with parchment paper. Whisk flour and baking soda together in medium bowl, set aside. 2. Heat 10 Tablespoons butter in 10 inch skillet over medium high heat until melted. Continue cooking, swirling pan constantly until butter is dark golden brown and has a nutty aroma, 3-5 minutes. Remove skillet from heat and using heatproof spatula, transfer browned butter to a large heatproof bowl. Stir remaining 4 Tablespoons butter into hot butter until melted. 3. Add both sugars, salt and vanilla to the bowl with butter and whisk until fully incorporated. Add egg and yolk and whisk until mixture is smooth with no sugar lumps remaining, about 30 seconds. Let mixture stand 3 minutes, then whisk for 30 seconds. Repeat process of resting and whisking 2 more times until mixture is thick, smooth and shiny. Using rubber spatula or wooden spoon, stir in flour mixture until just combined, about 1 minute. Stir in chocolate chips giving dough final stir to ensure no flour pockets remain. 4. Using a 1/4 cup, arrange dough 2 inches apart on parchment lined cookie sheet. I was able to get 6 cookies on one baking sheet. I baked a total of 12 cookies. They were 4 inches wide after they baked. 5 Bake cookies 1 tray at a time until golden brown and puffy and edges have begun to set but centers are still soft, about 10-12 minutes. Transfer baking sheet to wire rack; cool cookies completely before serving. I know this seems like it would take a long time but it doesn’t. It really is not hard to do at all. It took me under an hour to make and bake these really Simple and Delicious cookies. Give it a try. It is really worth it!! I was going to go grocery shopping tonight. Well, it started to snow and I had Martin’s car. I am not driving that little red car on snowy, icy roads. So, I ended up going home. I decided I wanted to make some comfort food. 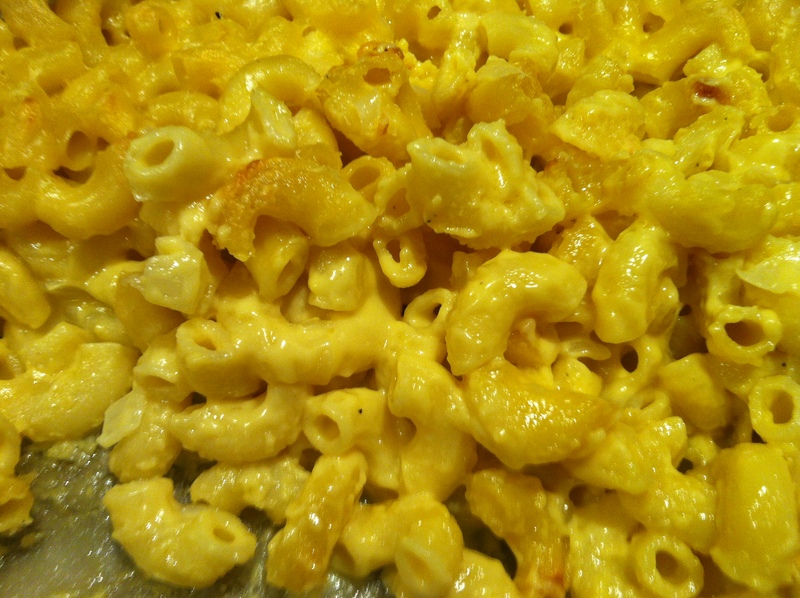 I had all the ingredients for mac and cheese. I have used this recipe for years. It is really easy and can be made in under an hour. What more could you ask for? Tomorrow, grocery shopping! 1. Preheat oven to 375 degrees. Also, cook your pasta. I tend to cook al dente. The pasta will cook more while baking. 3. Add flour and mix together. Then add half and half, bring to a boil, stirring continuously until thickened. 4. Add cheese and remove from heat. Stir until cheese has melted. 6. Bake for 30 minutes. That is it! Simple and very Delicious!! Kent requested Corn Bread this weekend. He never requests anything. So, when he wants something I listen! 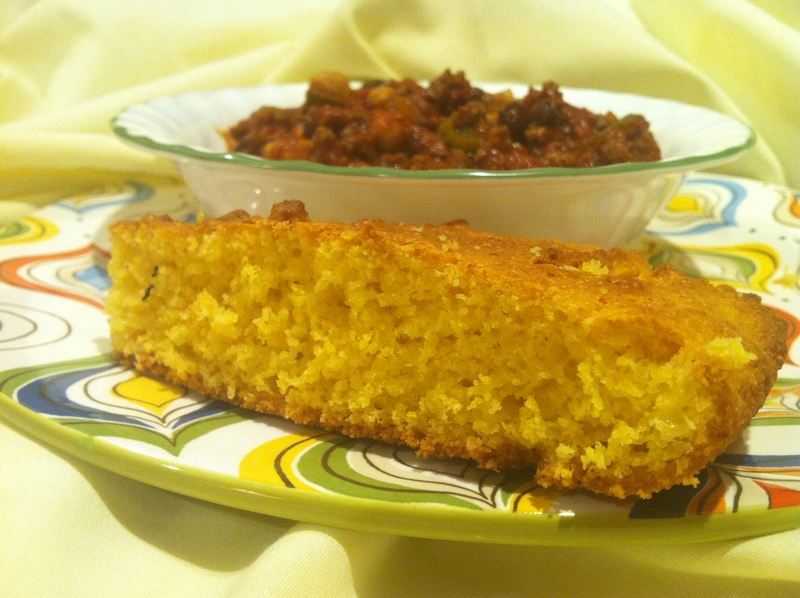 I made some chili and served with warm Corn Bread. Eric and Rachel ended up coming over too. They both had some and thought it was quite tasty. This was extremely simple and of course delicious. It also took no time at all. You should give it a try. I think you will love it! A cast-iron skillet (or any oven safe pan) is our first choice for this recipe, but a 9-inch cake pan will also work. Instead of heating it on the stove top, place the cake pan with the oil in the preheated oven for 5 minutes before adding the batter. 1. Adjust oven rack to middle position and heat oven to 450 degrees. Whisk cornmeal, flour, sugar, baking powder, baking soda, and salt in large bowl. Pulse corn, sour cream, eggs, and hot sauce in food processor until corn is coarsely chopped and mixture is combined. Fold corn mixture into cornmeal mixture, then stir in melted butter. 2. Heat oil in 10-inch skillet over medium-high heat until just beginning to smoke. Take skillet off heat; quickly add batter and place skillet in oven. Bake until toothpick inserted in center comes out clean, about 25 minutes. Cool cornbread in skillet on wire rack for 20 minutes (handle will be hot). Serve warm. That is it. How easy is that? Give it a try and let me know what you think! !